What to say, how to say it? I don't really know how to broach it. It feels awkward and out-of-place. But since it's also residing in me like a 900-pound gorilla, I don't know how to write around it anymore. I'm having a hard summer, folks. I keep waiting to get up one morning and feel like I've emerged from a strange, dark cocoon, but instead I keep waking up on the verge of tears. Depression is exhausting and maddening, the way it niggles at everything good in your life and turns the rest into an unmanageable calamity. It worms its way inside you and takes up residence like some kind of tropical parasite, keeping you up at night while it seems that the rest of the world sleeps blissfully. Other people's happiness is both a comfort and a finger in the ribs. It's hard to write through this fog. It's hard to stay focused, to give thanks for all the good things (and I know there are many good things), to simply keep putting one foot in front of the other sometimes. And it's not easy finding an appetite or a sense of adventure when it comes to food. But I made pickles the other day. It seemed easy enough, rounds of zucchini peeling off my sharp knife as I stood in the kitchen, the counter holding steady against my leaning hip; a sturdy comfort. All I had to do was slice zucchini and an onion, soak them in cold water and salt, then submerge them in a nose-wrinkling mixture of sugar and vinegar and mustard seed. I packed the pickles into jars and let them marinate in the fridge, for one night, then one week, and a fortnight. As the days passed, the pickles developed more flavor. I liked them best right away, crunchy and barely sweet, the fresh brine making me break out in a gentle sweat. But Fran ate them a good two weeks after I first made them and wrote, "The pickled zucchini are AMAZING. I want, I need the recipe. Addictions are made of that concoction of vinegar, mustard, garlic." I don't know how to shake off what's wrong. I keep muddling forward in the hopes that the sadness will just melt away eventually. Bear with me as I figure things out, would you? 1. Wash and trim the zucchini, then slice them one-sixteenth-inch thick; a mandoline works best, but a good sharp knife is fine, too. Slice the onion very thin as well. 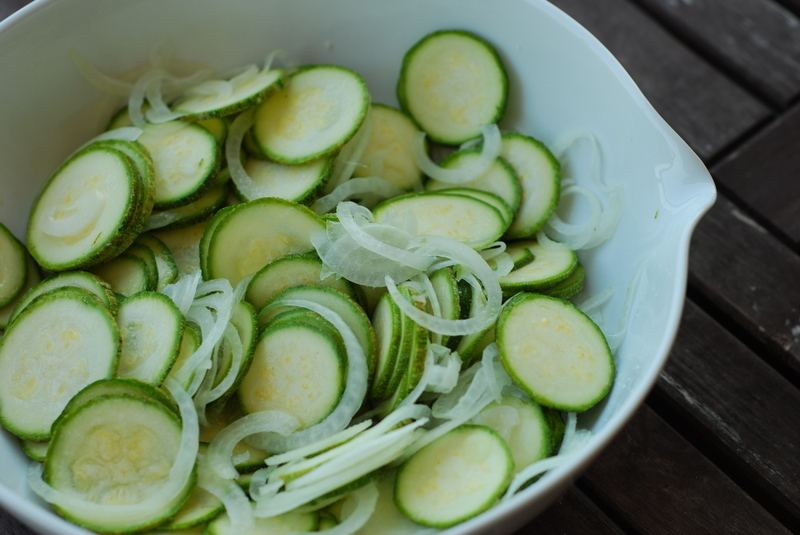 Combine the zucchini and onions in a large but shallow nonreactive bowl, add the salt and toss to distribute. Add a few ice cubes and cold water to cover, then stir to dissolve the salt. 2. After about 1 hour, taste and feel a piece of zucchini - it should be slightly softened. Drain and pat dry. 4. 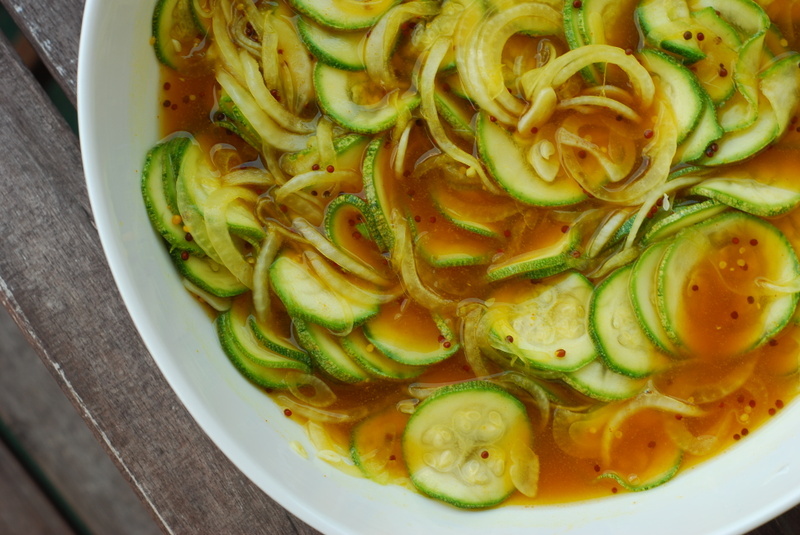 Return the zucchini to a dry bowl and pour over the cooled brine. Stir to distribute the spices. Transfer the pickle to jars, preferably ones that have "shoulders" to hold the zucchini and onions beneath the surface of the brine. Seal tightly and refrigerate for at least a day before serving to allow the flavors to mellow and permeate the zucchini, turning them a brilliant chartreuse color.